Laughing Matters with Brett Leake is picked up by American Public Television marking its ninth consecutive year of distribution to the nation’s public broadcasting stations.  Henrico County Administrators All Gaul is divided into three parts; sixteen hundred years later all of Virginia was divided into 8. These shires would be subdivided into cities and counties. The city of Richmond is carved from Henrico the Shire as is Richmonds neighbor Henrico the County. As early as 1619 Henrico was making plans for higher learning and today its public school system is the nations 99th largest, the fifth largest in the state and the one I was fortunate to attend. One morning in September 1966, I walked out the driveway across Crenshaw Road to the corner with Brook Hill where the swings, a sliding board, and a seesaw were beneath a scrum of children and where I waited until my neighbor Mrs. Bradley showed up. 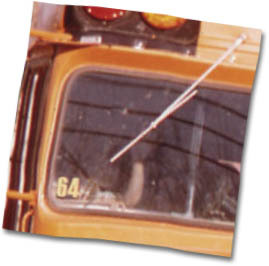 She drove bus 64 and when she threw open the folding door my climb to higher learning began. My mom let go of my hand and pushed me up the big step into the bus and onto a ride that has not yet come to a stop. It didnt all make sense back then. It would be the high school track coach of all people  a man who had us wind down from running laps around the football field by running laps around the basketball courts  who first saw that my changing physical being needed adaptation and whispered into my ear as I ran past head for the showers requiring of me one lap less than my classmates; I got my first taste of economics the science of scarcity from the man in charge of abundance, the head coach of the high school football team, and when my mouth muscles became too weak to continue to play a clarinet my band director extended my time in concert band by moving me to an instrument that required a tighter embouchure and was more difficult to play. I said thanks for the continuing education of lifelong learning – its the things in life that dont make sense that have been for me the wellspring for joy and provided my days with additional meaning and purpose. My brother, Derek, and his wife Anne-Marie attended Henrico County Public Schools, too. Their son, Philip, is now in first grade at Pinchbeck Elementary and I wish for him the same competent caring guidance that nourished me. Mom has a fun way of seeing the world, doesnt she? 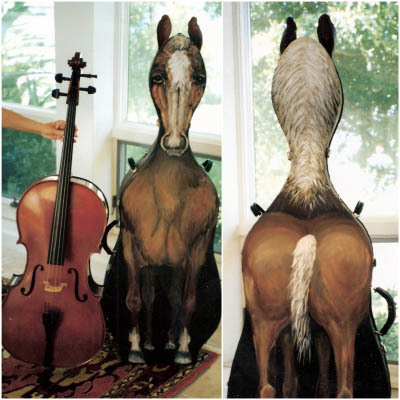 She painted this instrument case in 2000 for a friend and now we know what a cello does during all those measures not under the spell of Dvorak or Elgar. Its hoping you ask for a ride or looking wistfully out the window. In November 2003 my mother was waiting at an Amtrak station in Richmond, Virginia bound for New York and the Met to see the opera La Juive. The train was just arriving when she felt something was wrong and reached out for her husbands arm. Max, I dont feel so good. and she collapsed on the platform. She couldnt have timed it better. Had the all aboard included Mom she wouldnt have reached a hospital soon enough for treatment for what turned out to be a subarachnoid hemorrhage. There would follow months of close calls. Her bleed was in the connective artery at the base of the Loop of Willis, a difficult area to treat. She would endure nearly necrotic cerebral vasospasms. An optical nerve got involved and her left eye stared off into the distance. Spinal fluid kept building up in the brain. All this riding an undercurrent of congestive heart failure. But my mom would be one of the lucky ones. She has an understanding husband who like her is a trained pharmacist. He knew the medications prescribed. He and his son Steve, a general practitioner, questioned the ones that didnt make sense. They knew and spoke up when she was moved to a rehab facility before she was ready. There back at the hospital things would begin to settle down after her fourth shunt. Because she received immediate attention and lots of support at home she would slowly recover. By April, 2004, five months after she missed the train, she would report that even her left eye was coming around. She didnt like what she saw as she sat in front of a mirror trying to get her left eye to look forward again so she would sing to herself a bar song One eye on the pot, and the other up the chimney. She kept singing, the eye muscle got stronger, and when it straightened one day at the clinic the speech therapist let out a Whoop! She began to read more, write in smaller fonts and started to play. Seeing soon became creating sculpies (a polymer clay that hardens into a ceramic at conventional oven temperatures), then some paper-mâché, and now seven years later a crack at portraiture again. Mom loves giving gifts and she loves even more making the gifts we, the receivers, get. 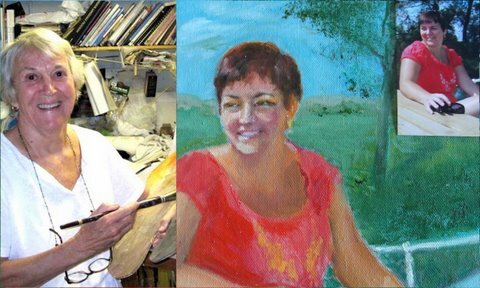 She painted this portrait from the photo (top right) of a new friend, Isabelle, she met on a recent trip to France. Moms eyes capture those of her friends radiating in the French landscape near the river Meuse. In 2011 the ole girl turned 79 and her vision keeps getting better. The self proclaimed ‘Doll Whisperer’ can now peer into one’s inner self. Look her up at http://www.linkedin.com/pub/sylvia-reinhardt/20/328/873 or drop a note to sylreinhdt@aol.com. She’s hopeful – one day she may see La Juive. P.S: Question for Mom: Lorsque vous obtenez une chance peut vous prenez un balai? Je pense que le violoncelle vient de faire un bobo. Translation: When you get a chance can you grab a mop? I think the cello just made a boo boo.